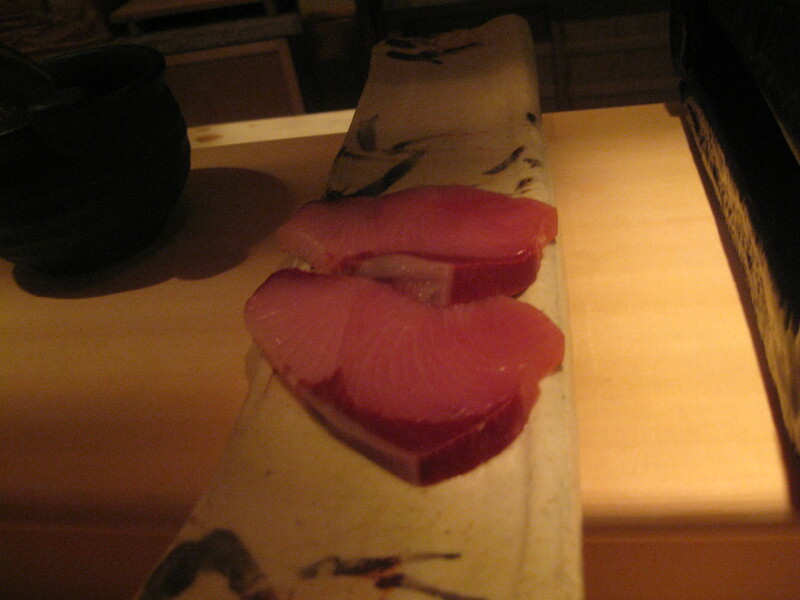 Joseph Mallozzi's Weblog: November 29, 2009: Tokyo Travel Day #5 – Faro, Kadowaki, and the Sights of Ginza! 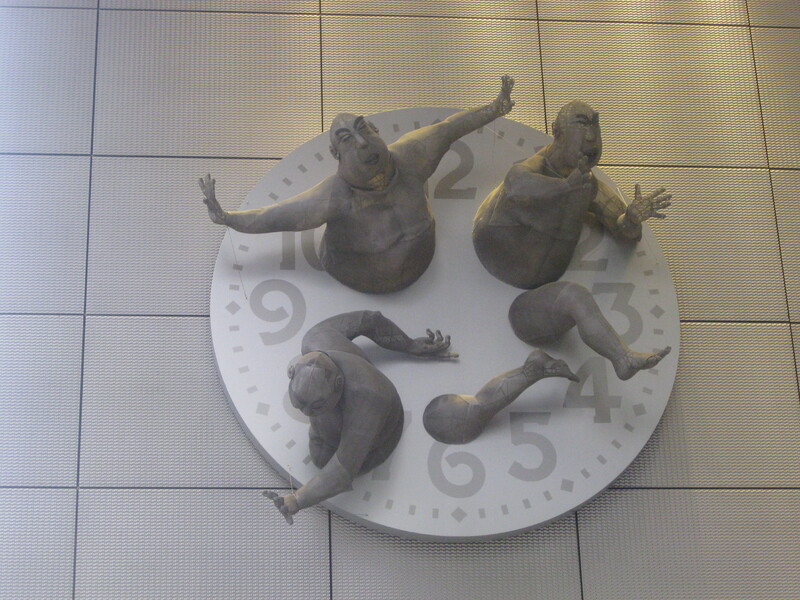 November 29, 2009: Tokyo Travel Day #5 – Faro, Kadowaki, and the Sights of Ginza! I honestly don’t know how I did it on previous trips here. Between all the eating and the drinking and the strolling and the not-much-sleeping, when the hell did I ever have time to blog? Anyway, another full day yesterday. I spent the morning uploading a whack of pics and videos, then headed out. 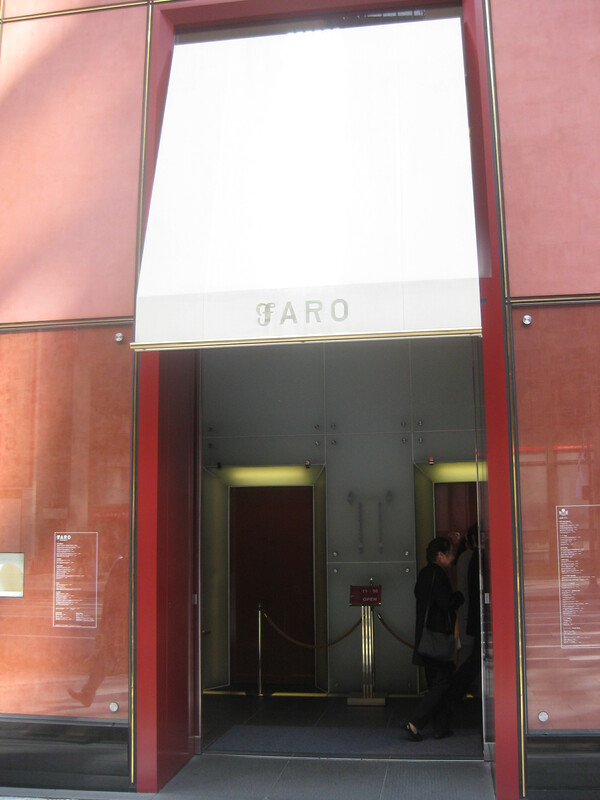 Lunch was at Faro, a beautiful Italian restaurant located in Ginza’s equally beautiful Shiseido Building. The elevators whisk you up to the tenth floor restaurant, the doors opening onto a tiny reception area. 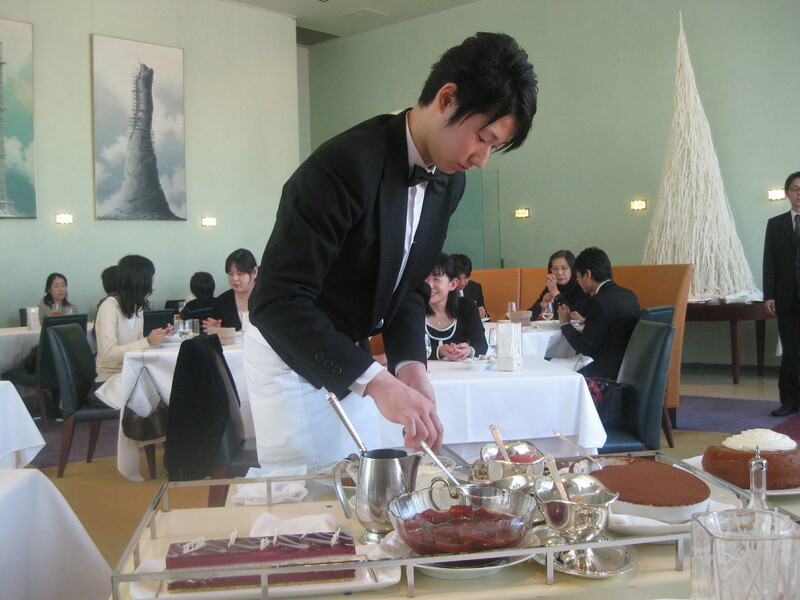 A left turn and you’re in the expansive dining room, a bright, elegant area with an enormous bay window looking out on the Tokyo’s high fashion district. My very own chopsticks. 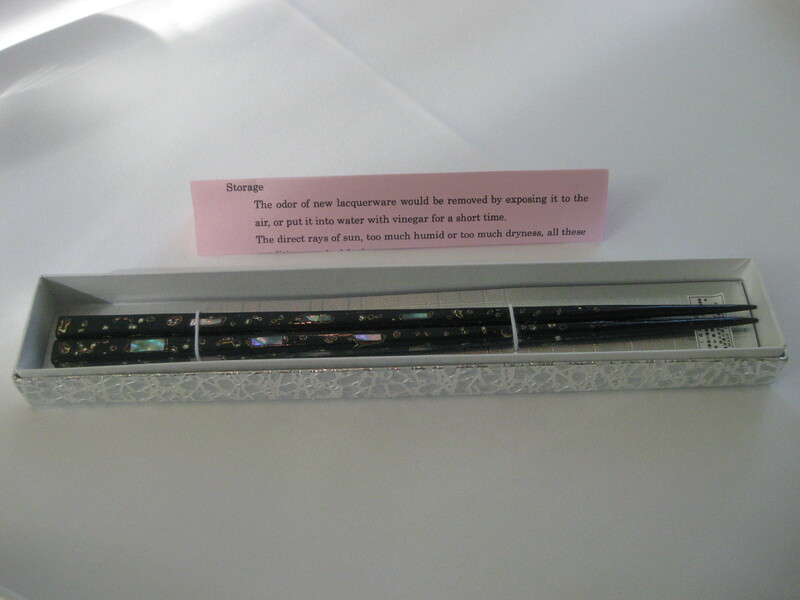 And, for what it's worth, I enjoy the odor of new lacquerware. 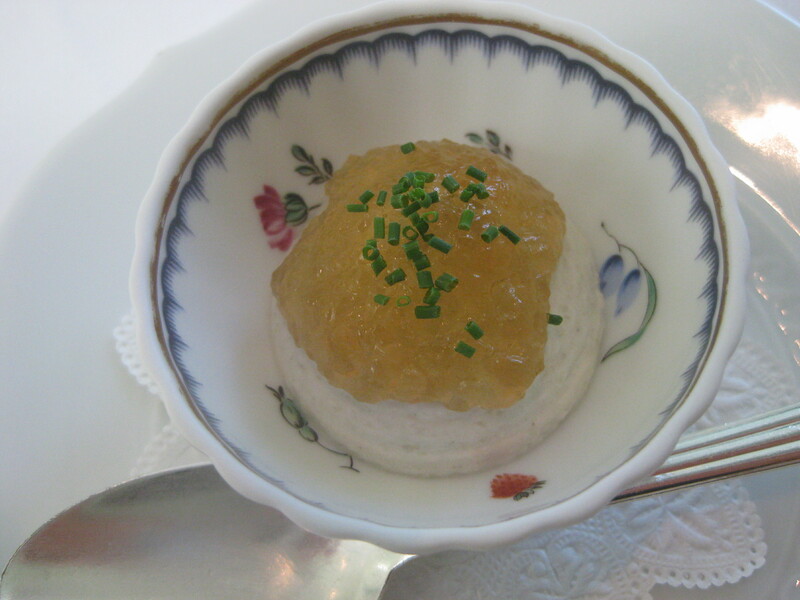 The amuse was a delectable little jellied scampi on dill cream. 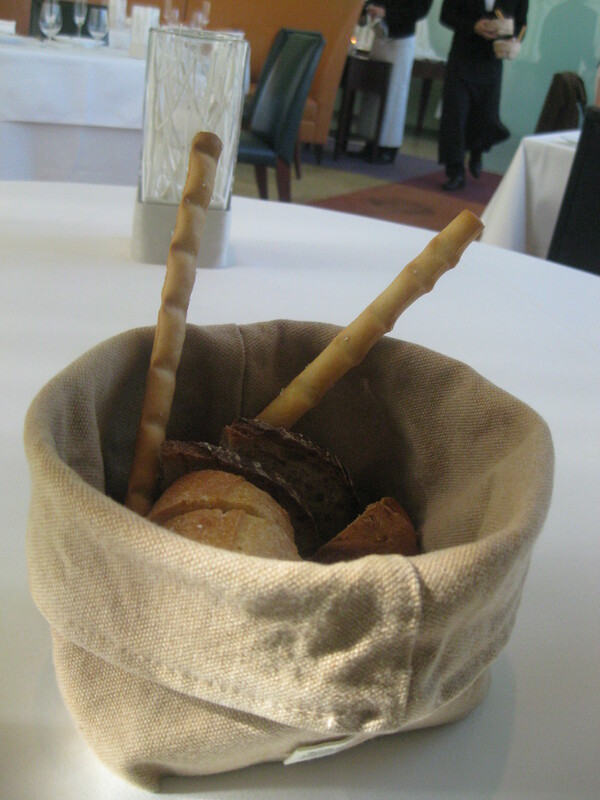 We were served a selections of breads in what looked like a hat. First up, a delicate yet satisfyingly earthy porcini and eggplant mousse. 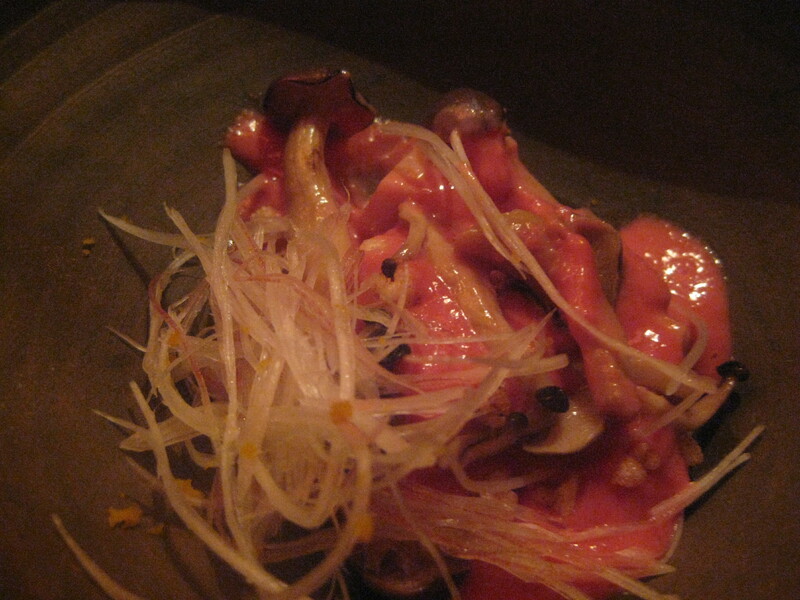 I loved its composition, the warm, creaminess of the porcini married with the slightly denser pieces of eggplant. The dish of the day! 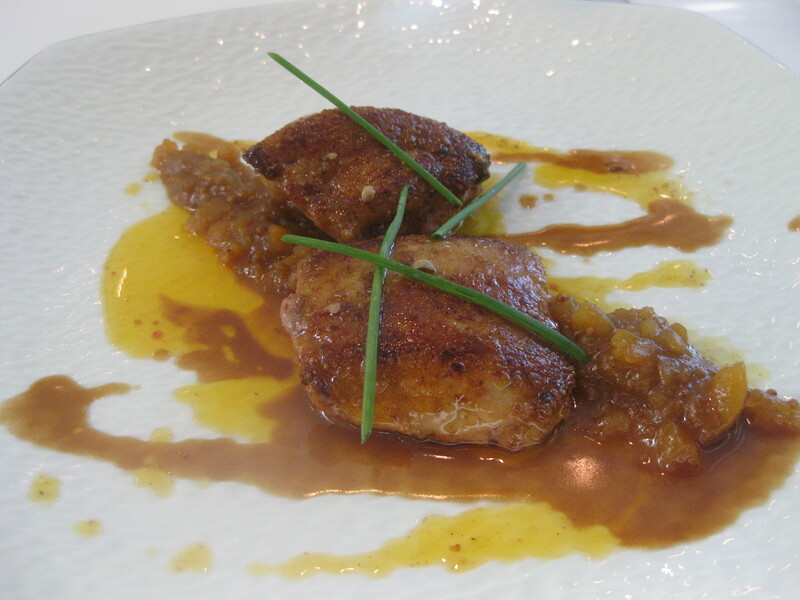 Foie gras with chestnut chutney. If I was on death row, this would be on the menu for my last meal. 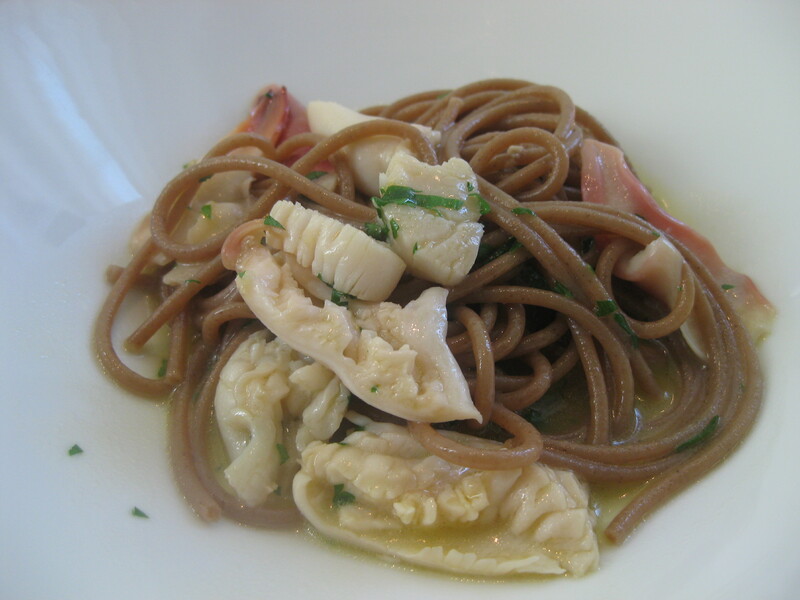 A nice little spaghetti al radicchio with (what I believe was) ark clam. 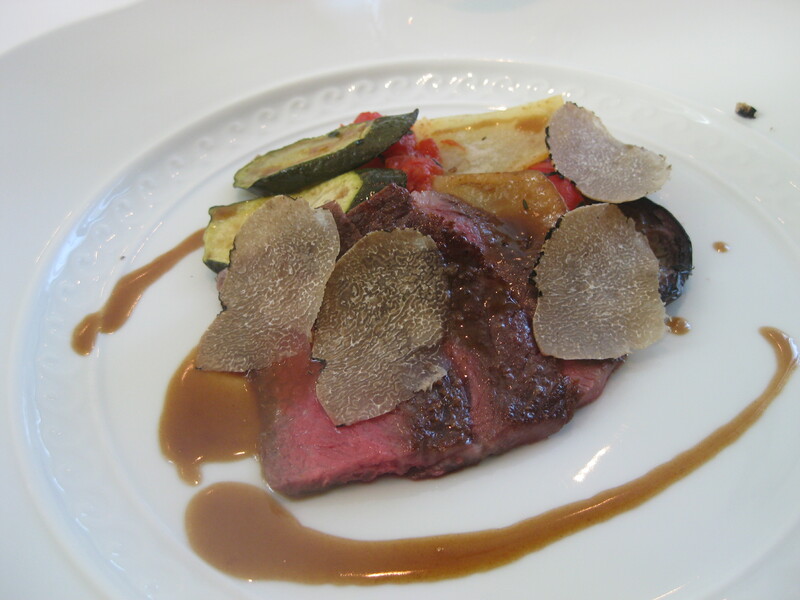 An outstanding "sottofesa di manzo" (the lean, prized cut is sourced from the cattle's hindquarter) with black truffle sauce. And to finish, perhaps a selection from the dessert tray. Wait! Did I say "a" selection? Let's go with "several" instead. 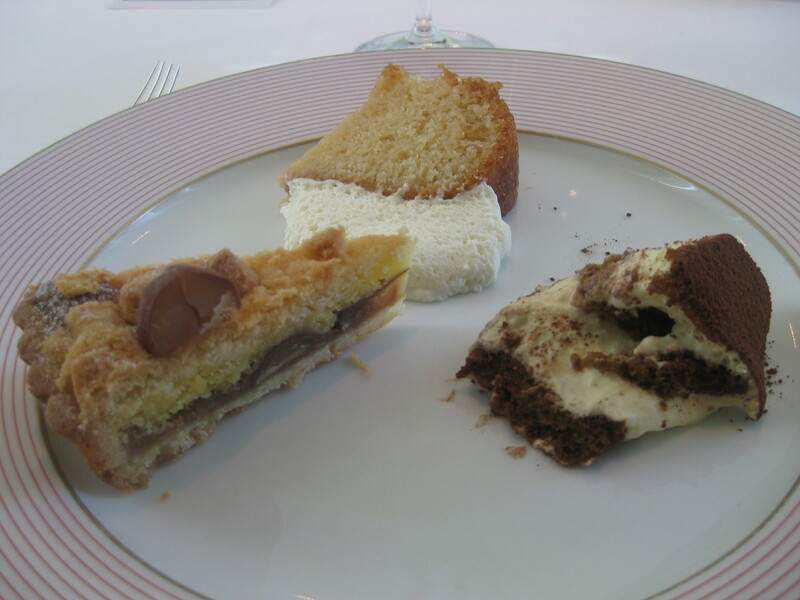 I found the tiramisu a tad too boozy, but thought the chestnut pie very good, and the savarin exceptional. 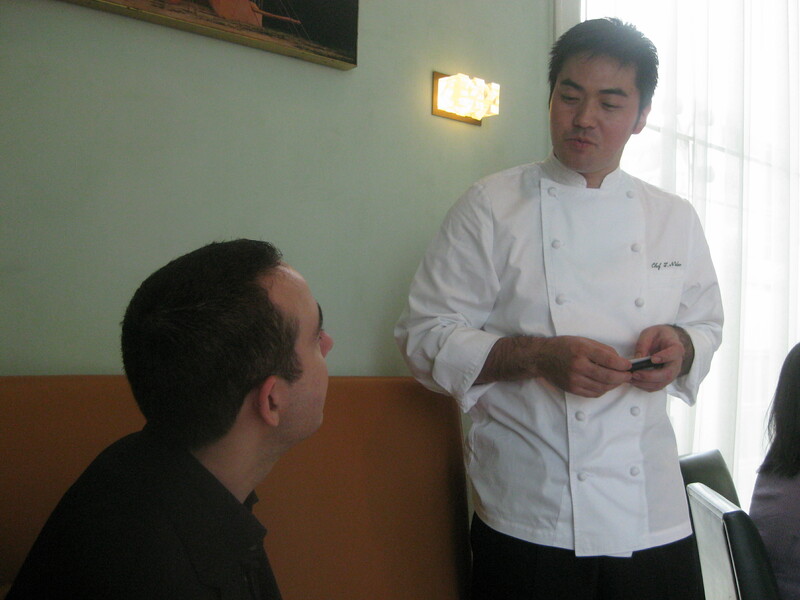 After lunch, Faro's head chef, Takahiro Nakao, came out to chat. Having spent three years in Italy honing his craft, his Italian is better mine. 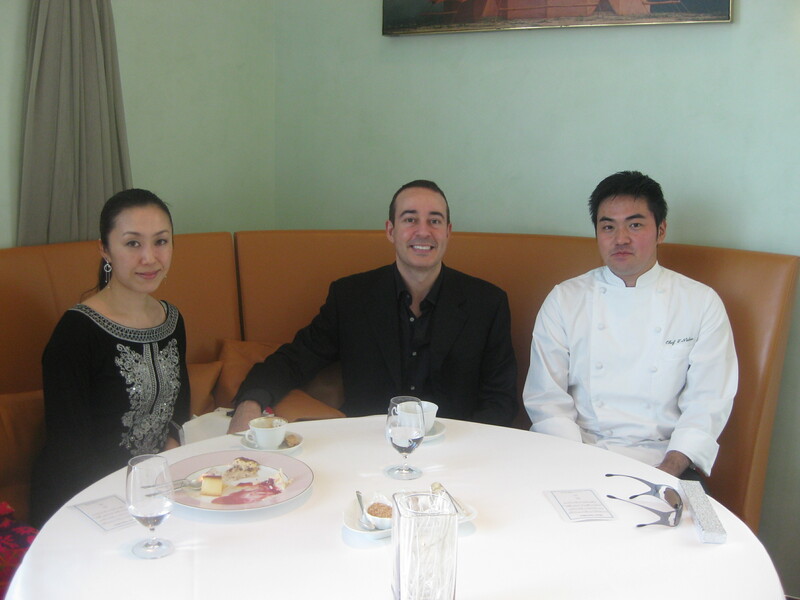 Uccalele, me, and Chef Takahiro Nakao. Hey, you know who likes canned coffee? 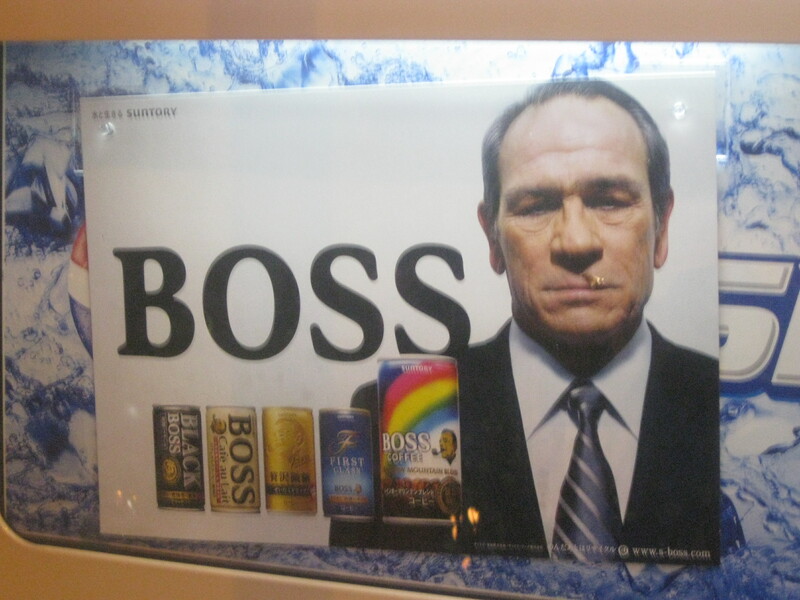 Tommy Lee Jones likes canned coffee. 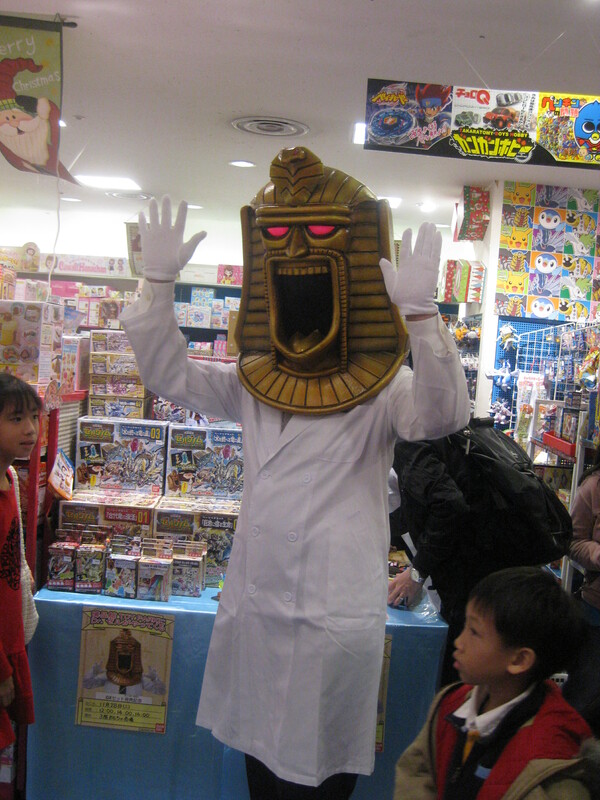 I ask you, what kid wouldn't enjoy having this lovable character lunging out at him from a dimly lit toy store aisle? I'm not sure whether it's a high-end product or a treatment for a condition. 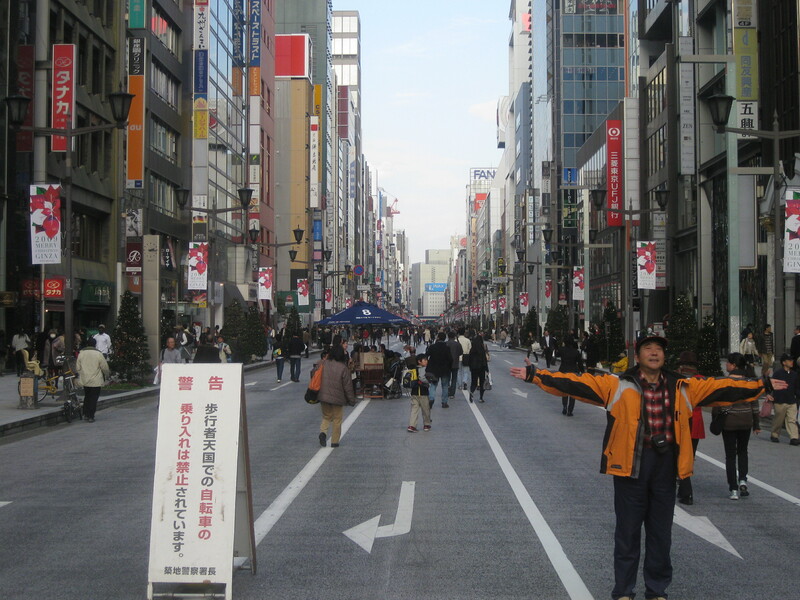 Every weekend, one of Ginza's main streets is closed to vehicle traffic. Check out the guy in the orange. He thinks he's Kate Winslet in Titanic, just imagining Leo's big, strong arms wrapped around him. I don't know. I know of like it. 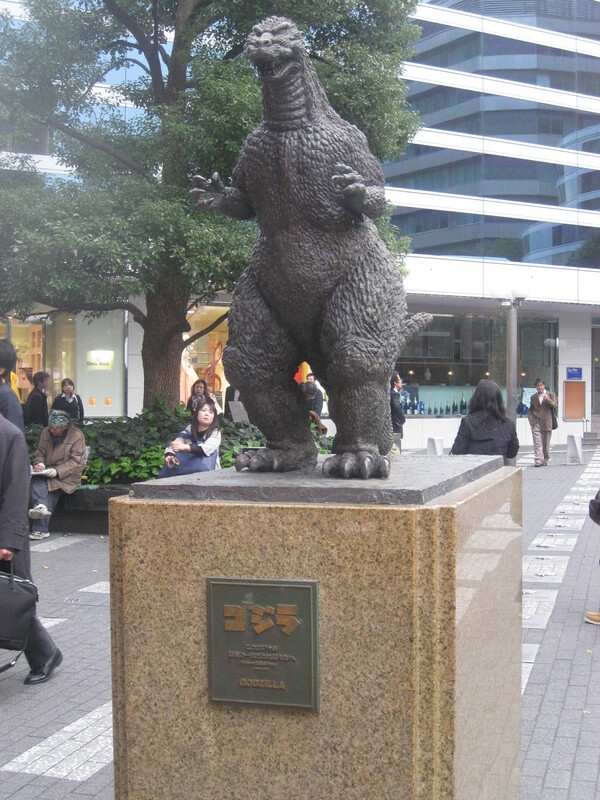 Statue commemorating Godzilla who passed away on this spot in 1963. Taking half of Tokyo and the Japanese army with him. 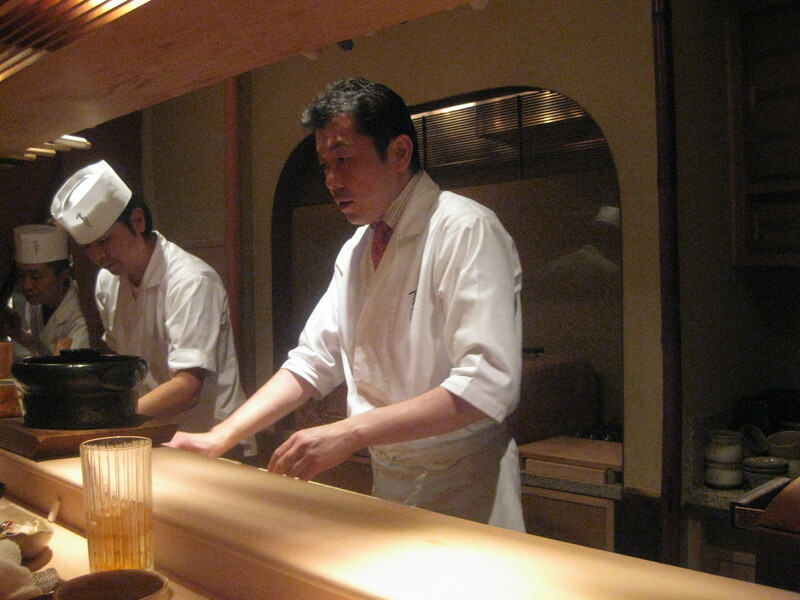 For dinner, I headed out to Kadowaki, a Michelin two star restaurant in Azabu-Juban. My dining companion on this evening was Anna from the isle of Jersey in the U.K. who was in the midst of a whirlwind round-the-world tour. I caught her on her last night in Tokyo as she prepared to head off to take a job in a ski resort in northern Hokkaido (despite the fact that she doesn’t ski). 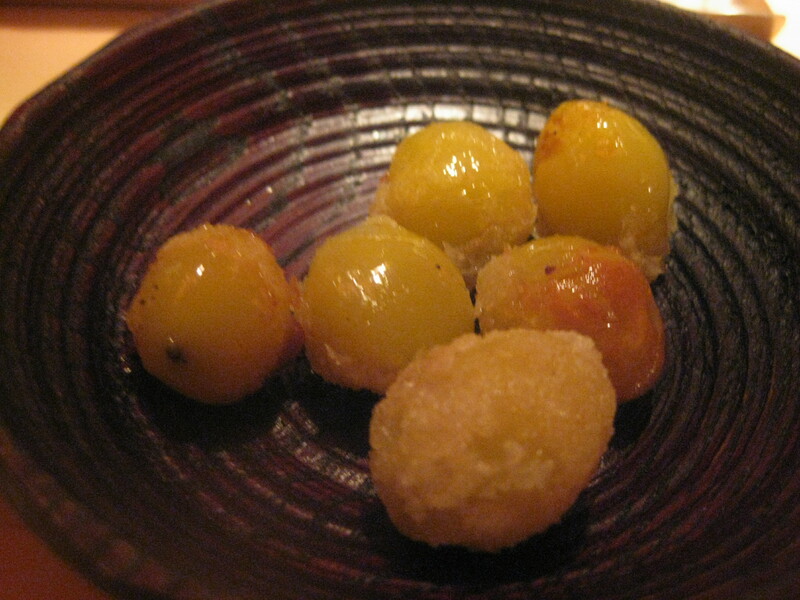 Gingko nuts, salted and fried. Addictive. Sesame tofu served with a beet-based sauce. And a phenomenal dish. I'm not one for tofu, but Ishikawa's version is a hands-down winner with a consistency unlike any I've ever sampled before. 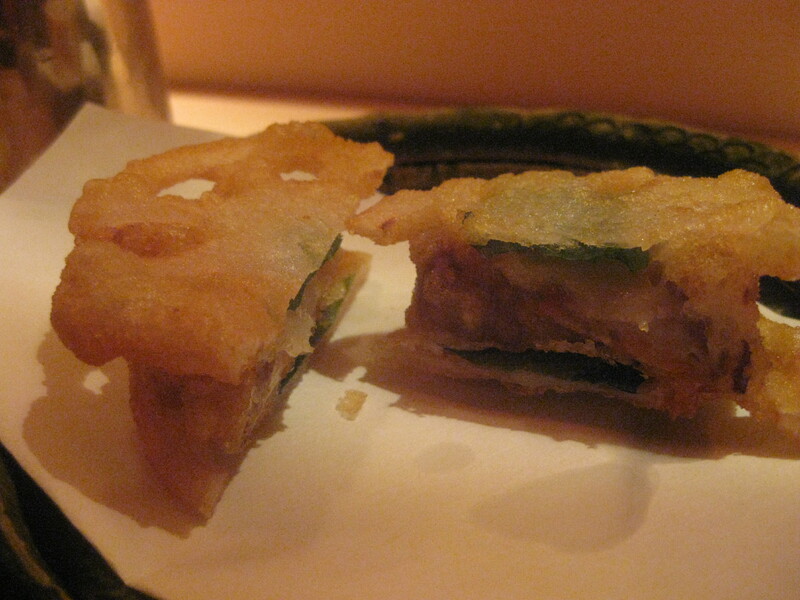 Crispy lotus root and ankimo (monkfish liver, the foie gras of the sea). Loved the textural contrast. 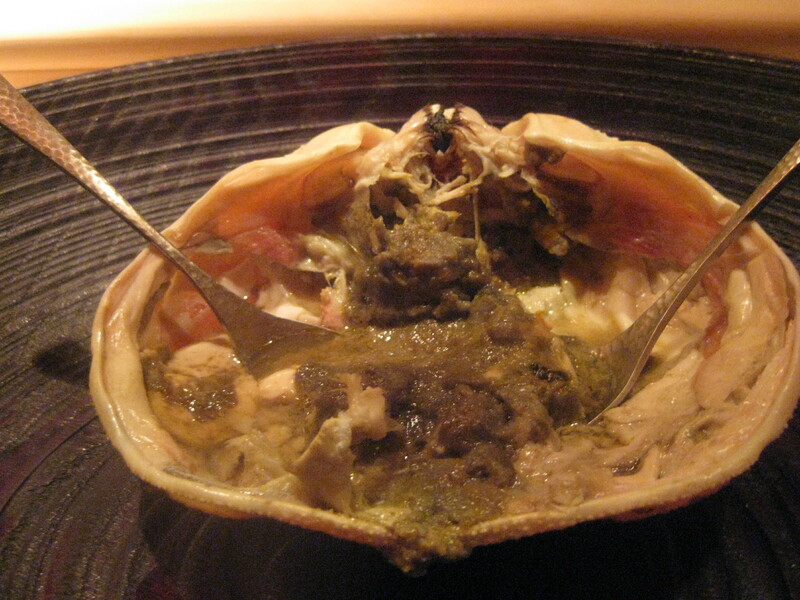 And, of course, the crab guts. The best part! ...and served rare. Seemingly simple but excellent. 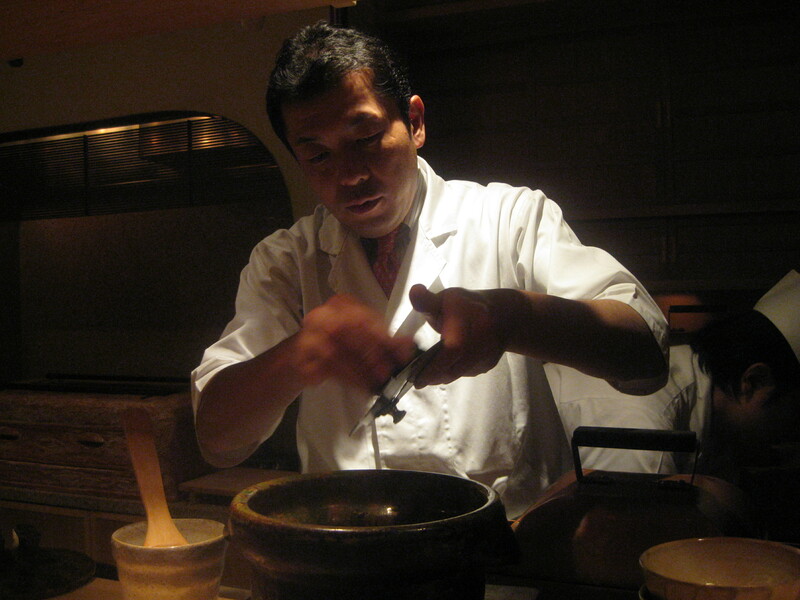 Shaving the black truffle onto the rice. 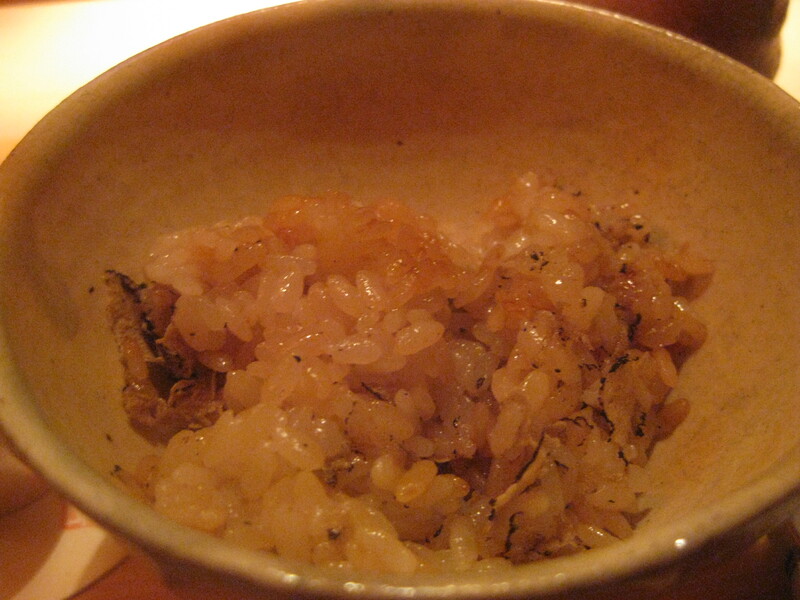 The rice was delicious and incredibly aromatic. 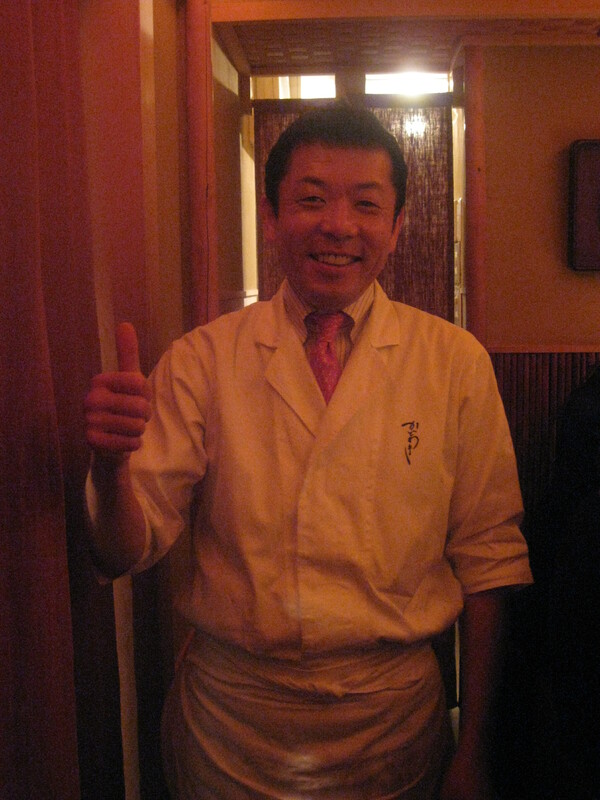 After we finished up, the Chef came around to see us off. 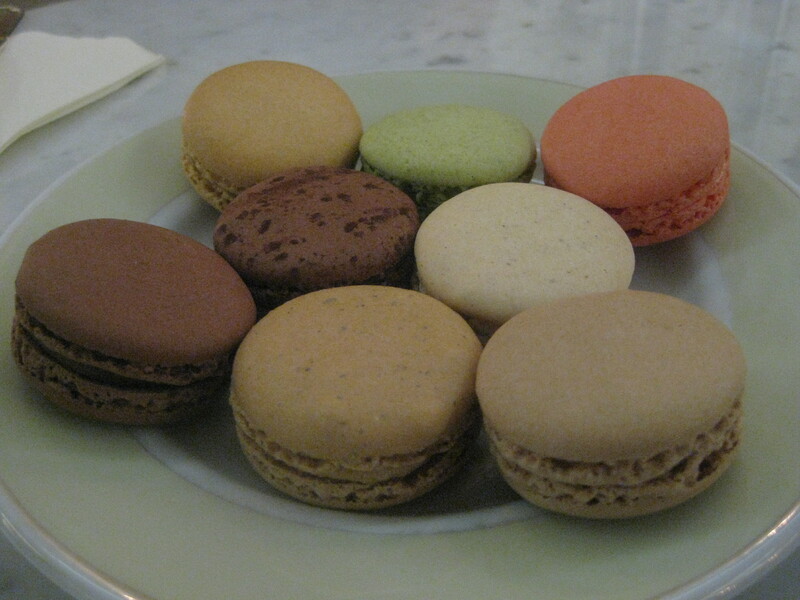 After leaving the restaurant, Anna and I caught a cab to Ginza where we enjoyed some late-night sweet treats at Laduree. 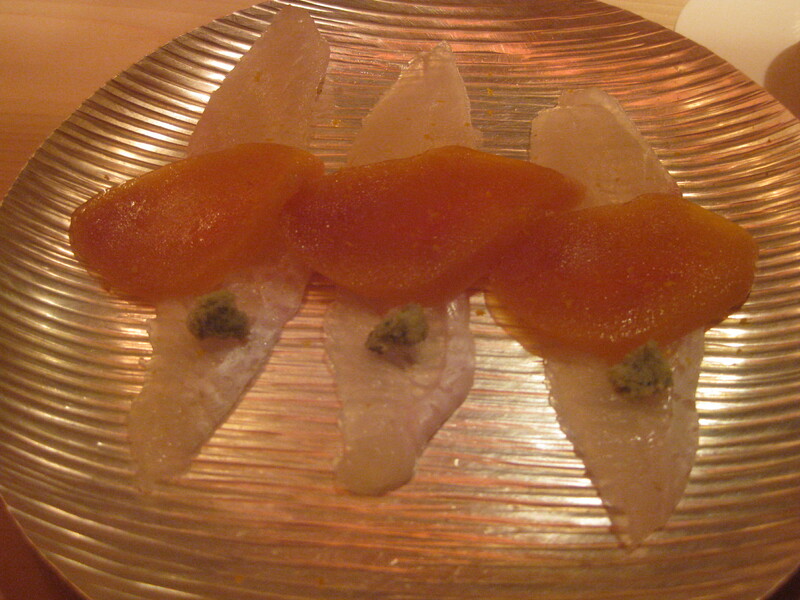 Previous Article November 28, 2009: Tokyo Travel Day #4 – Dai San Harumi, Tokyo Big Sight, Les Creations de Narisawa! Now With 60% More Robots! I know there are comments…you are busy and probably can’t get to moderating them. Maybe you should have let Carl do it while you were gone. Give him something to do while he was strolling through the studio (on duty of course). The pictures are spectacular. I cannot even imagine what research you must do just to find these wonderful places. It is a joy just to behold. I know many people come to this blog wanting Stargate stuff, but I am actually quite enjoying your posts from the trip. 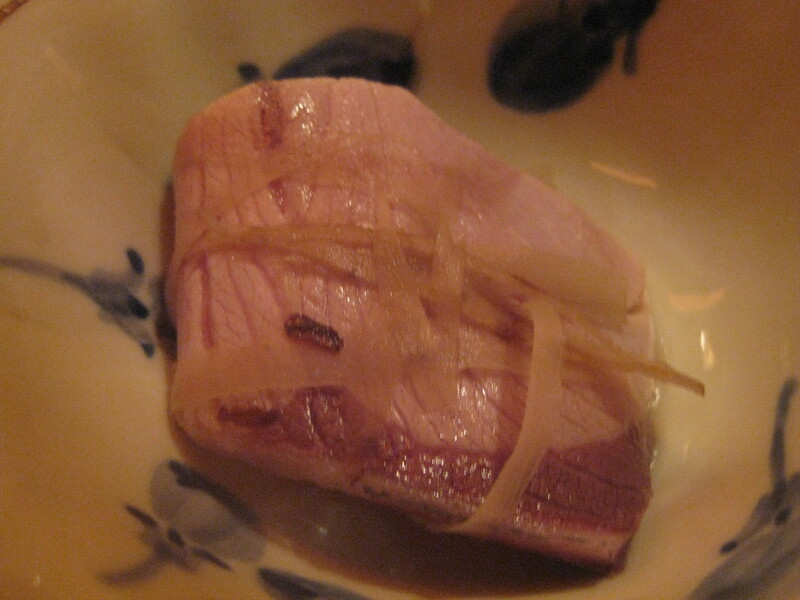 I’ve developed an avid interest of Japan and its culture, but never though hard about what kinds of restaurants that they have. Most people, myself included, have a stereotype of Japan inside of our heads, but you open the reality of how normal they are. They have a variety of food just like us. I just hope you get your full of ramen while there! I love regular maruchan ramen, but an actual bowl of ramen is said to be quite delightful. Sapporo ramen is said to be famous, so I hope you try some! I see that you are enjoying yourself, so I hope that it continues! The food in these restaurants looks spectacular. I am not sure if I could eat some of it though, you have a more adventurous palette than most I think. I wonder if you would, for us mere mortals, mention the price of some of this , it would be interesting to know how much you have to spend to experience such a high level of cuisine! More great pictures, and vivid descriptions. It’s like your own version of giving us the 12 days of Christmas. Thanks for all the labor of posting, not to mention the physical demands of maintaining such a pace of eating and walking and not sleeping. So far (judging from your stories and pics), the Dai San Harumi sounds like what I would have liked best. 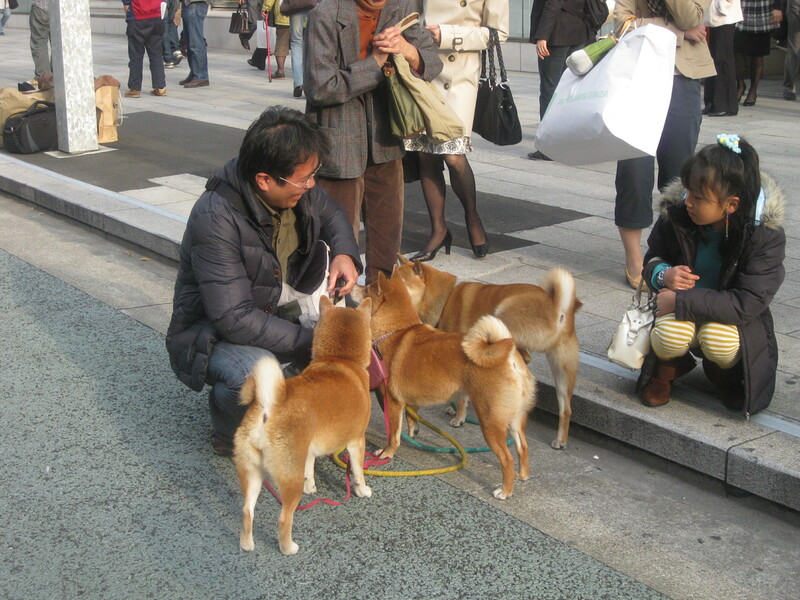 Imagine yourself deeply envied ^^"
May some weird-food-purchases find their way towards yourself! Thank you for all the reports but especially for that photo of the Godzilla (Gojira) statue. He’s certainly a lot smaller than I remembered. 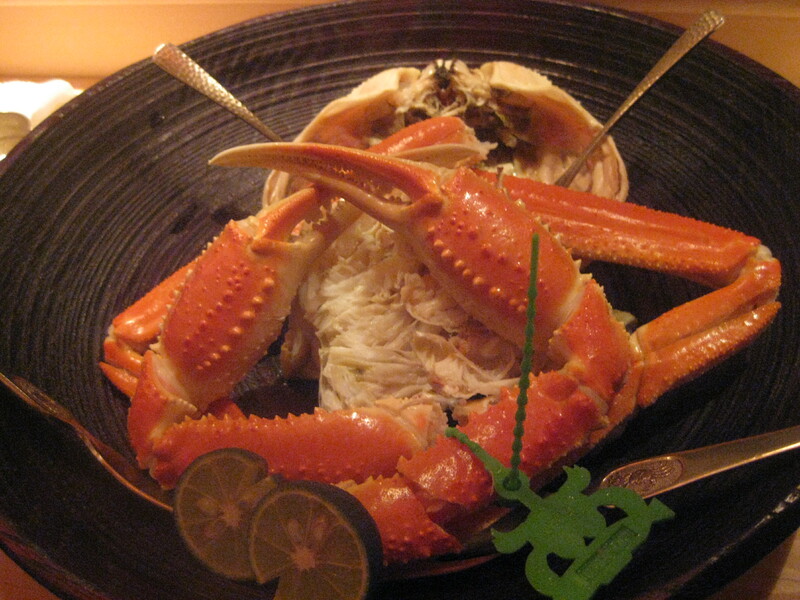 Not one for tofu, but you love crab guts?? You’re a very strange little man. 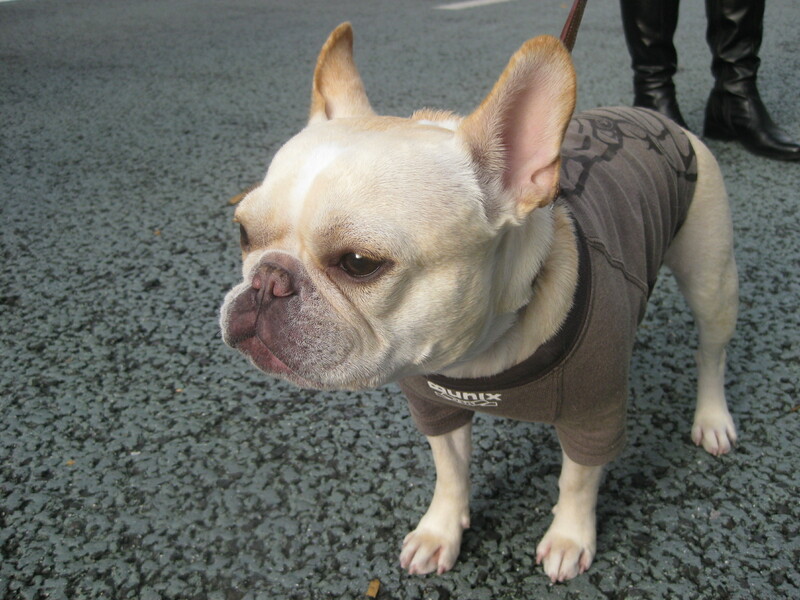 Love the pictures, and I’m certainly enjoying the sights of Tokyo, especially the little Frenchie. But my favorite? For those asking, dad seems to be better this morning – he just called me at 8 am on the dot (he knows it’s the LAW in my house that he’s forbidden to call before that…so he called mom first at 7:00. If he could, he’d be calling at 6 am – if he’s up, EVERYone has to be up!! He’s a real piece of work, but I love ‘im…). Doctors think, despite his heart problems, etc., this episode was due to pneumonia, and so far he’s responding well. Keep those thoughts and well-wishes coming! Thanks, everyone. It looks so delectable sans crab guts. Wow, when do you find time to blog. Those meals! I remember your blogs on deciding where to eat while on your trip, but wow! It is too bad you aren’t a Hobbit, then you would HAVE to eat twice as many meals a day, and still keep your trim figure. 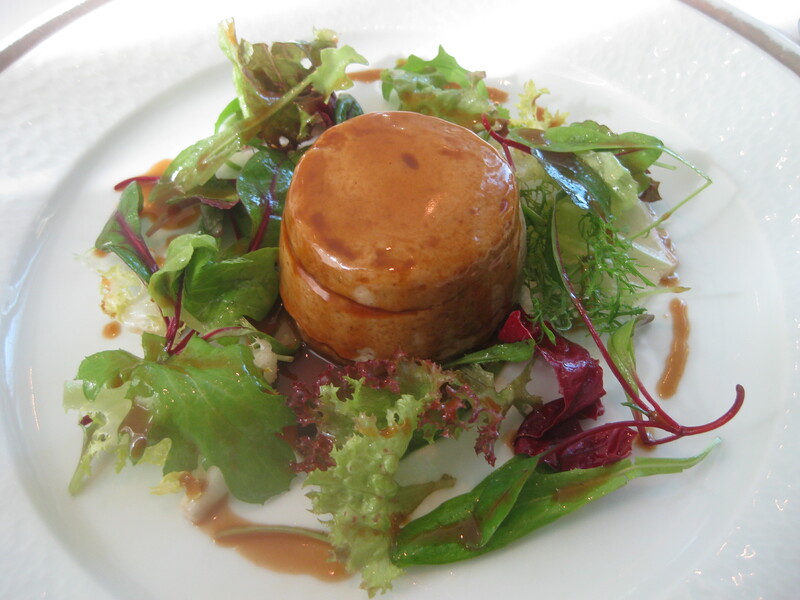 Who knew you could find so much foie gras. Thanks for taking us along on your holiday. I’m having a great time and your blog is much better than a few measly postcards. Now you have gone and done it, found the pup (it is cute) and I hope you won’t feel the homesick pangs, remember to bring the presents and the pugs will still love ya. Thanks for sharing your fun with us. Wow. Tokyos looking better and better each entry. I’m getting uber jealous of you. Glad your having a good time though. Mais comment faites vous pour manger autant de choses en une seul journée, vous devez avoir un sacré bon estomac^^! En tout cas ça me fais vraiment plaisir de vous voir aussi heureux, ça se voit que vous aimez vraiment cette culture! I wonder how many of us would really be jealous of Joe if WE were the ones eating crab guts and cod sperm. With all the eating you’ve done, I assume you must have a new, larger suit? Das: great about your dad being better. Pneumonia can make one feel pretty crappy. It’s a good sign that he is calling. When I get that sick, I like to be left alone. Feed me and leave. I bought a new laptop. Windows 7 has been really easy so far. Plug and Play for real! It even has blu ray on it. Mr. M.! Loved the pictures/videos!!!! How do you hold all that food? Thanks Mr. M. for sharing all the experiences with us. I’m not sure how you find the time, but we appreicate it!!! For what it’s worth, Hermes, Birkin and Kelly are all names for the same style (with very minor differences) handbag. We sell the Ostrich Leather Kelly. Just the thing Fondy would love for Christmas. It all looks so good. I’m not sure I could eat most of it though. I’m a meat and potatoes type of gal. Crab guts? Are they really that good? They look a little watery and squishy to me (Couldn’t think of a better description). Godzilla. I guess no trip to Japan would be complete without Godzilla. He is rather small though. Glad to see you are still enjoying the trip what with the lack of sleep and all. @Das, prayers and positive thoughts for your dad’s continued recovery. Cool chopsticks! Very thoughtful gift to give a person who is eating his way through Tokyo. How do you get all these great chefs to come out and meet you and take their picture? Are you getting famous (or infamous)? 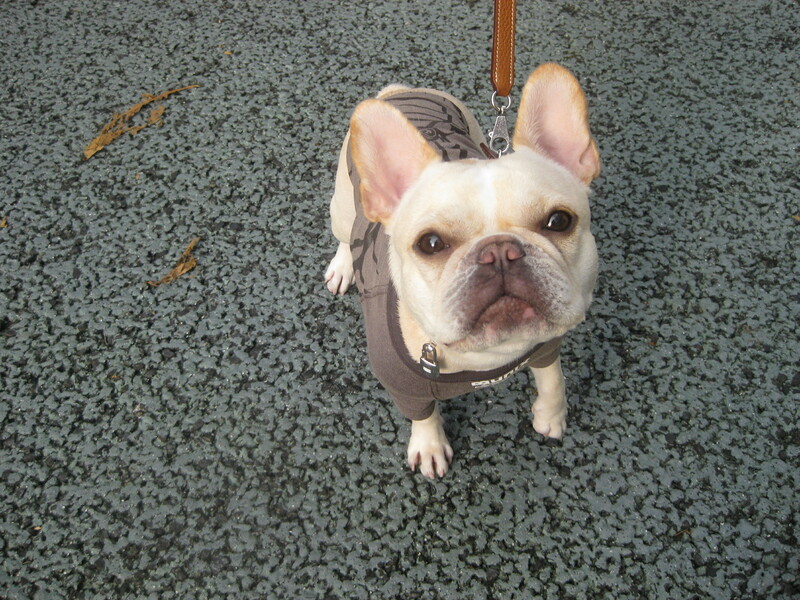 Is that the little Frenchie you met last year? Surely not, but just as cute. Crab guts? Yuk. Another stupendous entry! Thanks. 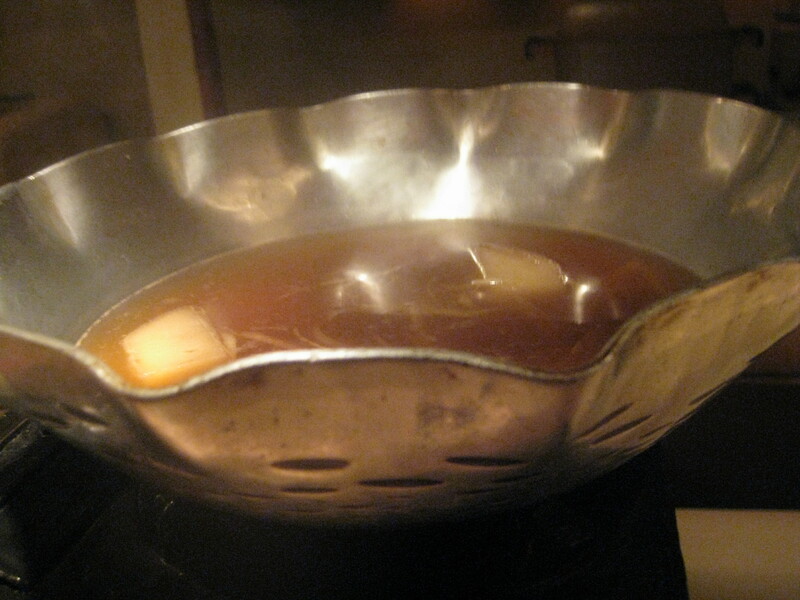 re: smoked glass last night: i think Blumenthal may have come up with that gimmick. Was the pear capsule done with gellan? Yum. Sesame tofu – one of my favorites and something I can’t get here. The food looks fabulous. 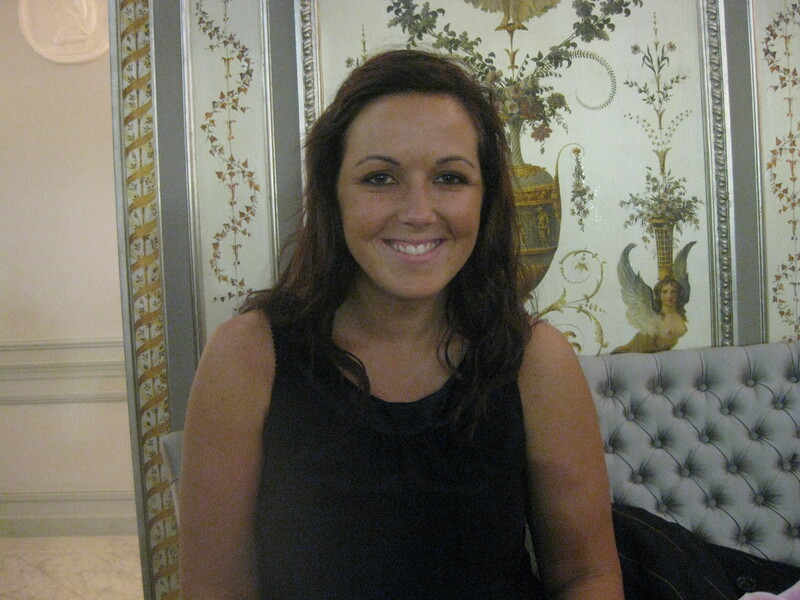 Thanks for the squeezing the blogging and pictures into your busy vacation schedule – we really appreciate it! I’ve been busy and away from the computer for a bit, so I didn’t know about your dad, das. Hope he’s on the mend and well again soon! crazymom – I was listening to this song when I read about Emma. The sky lanterns seemed fitting. We’re going to launch one for her next time we’re in Thailand. Joe – Aren’t you full yet?